If you follow me on twitter, you'd know how much I've been obsessing over my skin/skincare products so I wanted to bring you a super affordable edit in collaboration with Neutrogena. 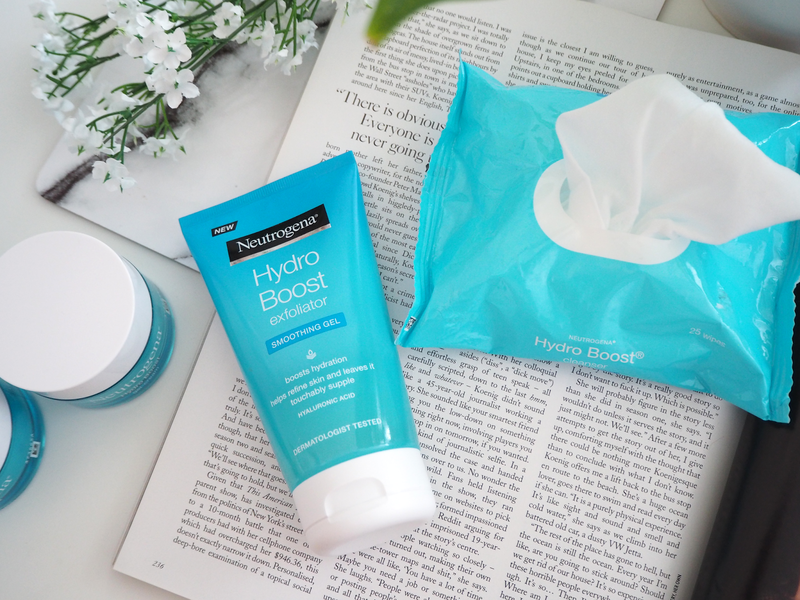 I've been trialling Neutrogena's Award-Winning Hydro Boost range - targeted at putting moisture back into skin that may be lost through lack of sleep, dehydration, the environment and many other factors. 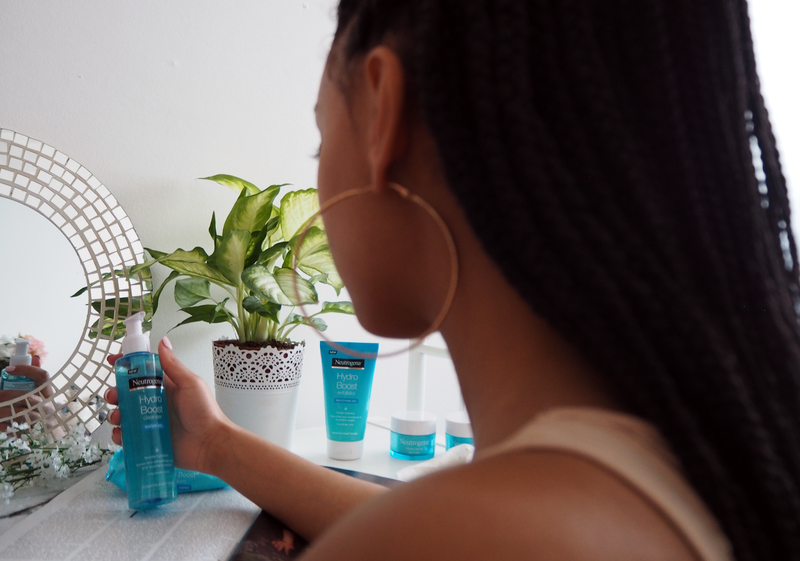 As we all know, hydration is the foundation for healthy skin and Neutrogena really do work hard to ensure that their products do just that - hydrate. Overall my skincare routine is pretty simple, despite being a trained facialist. I have a combination of dry and oily skin, where in the past have found it quite hard to combat the two textures at the same time. Neutrogena’s HydroBoost Water Gel Cleanser & Gel-Cream Moisturiser works in my favour though. The gel cleanser lathers away excess oils and makeup that’s in my skin, while the Water Gel Moisturiser puts it all back in. Speaking of makeup; If you’re looking for a makeup remover that offers a quick-fix, this is your go-to product. Neutrogena’s Hydro Boost Gelée Milk Cleanser works wonders for removing makeup in the most efficient way whilst also hydrating. The no rinse formula makes it easy to remove makeup without having to wash your face especially after a long day out. For those of you that are short on time, this product is for you! When it comes to achieving the "perfect skin", I truly believe that it's about testing what you've done thorough research on, and figuring out whether the products are well suited to your skin or not. I've had people recommend so many things they swear by that just don't work for me and vice versa. It's all about testing the waters and changing your skincare routine every so often (something I need to do more of as I get too comfortable). The Hydro Boost Skincare Range (created with dermatologists), encourages us to rethink the way in which we hydrate our skin, through the use of products we use on a daily basis. As I mentioned earlier, my routine is very simple and also quite natural consisting of loads of coconut oil/rose water on a daily basis. This works for me usually as I'm not prone to acne or severe breakouts, however find that my skin isn't as resilient as it used to be. As with all of us, there's so many things we could be doing to help improve the appearance of our skin, however when you don't have a lot of time on your hands, sometimes looking into reviving your skincare routine can seem like a big old chore. 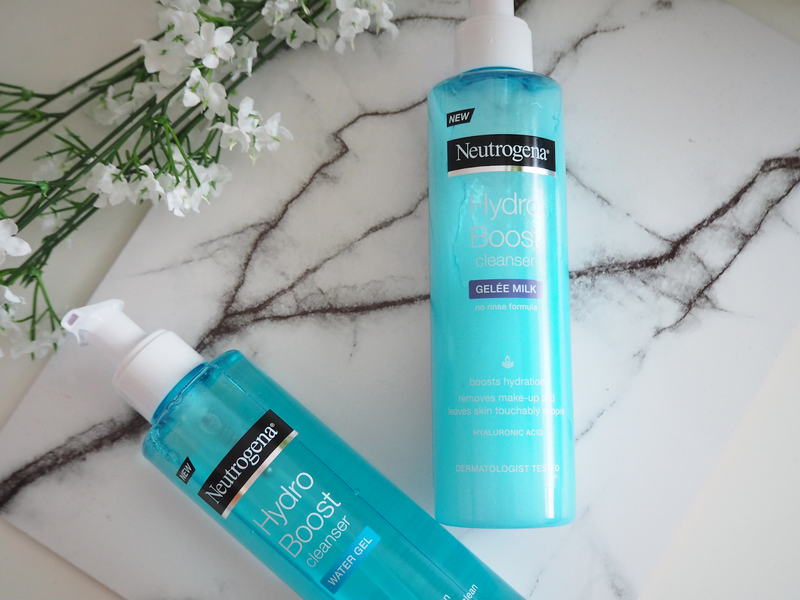 Neutrogena's Hydro Boost range has made this very simple and affordable for all of us. 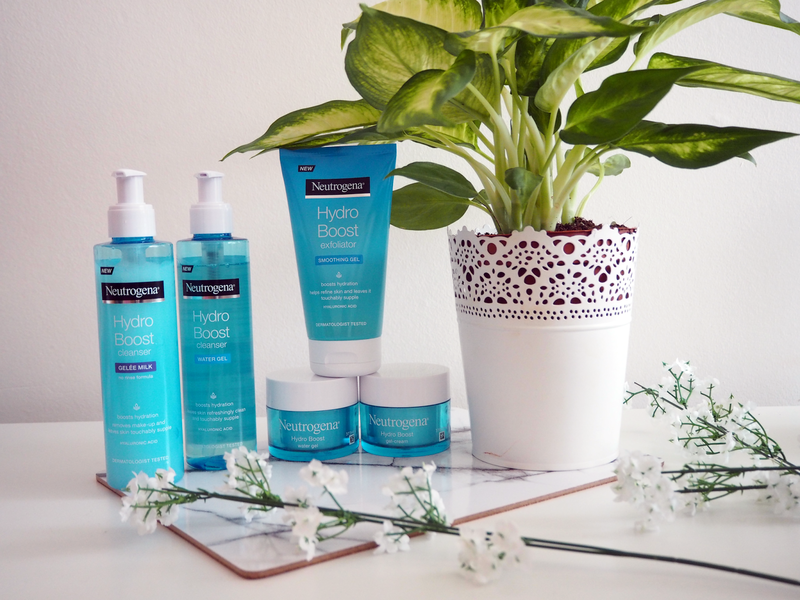 There are 7 products in the Hydro Boost range that aim to instantly lock-in intense hydration whilst progressively releasing it throughout the day as and when your skin needs it most. 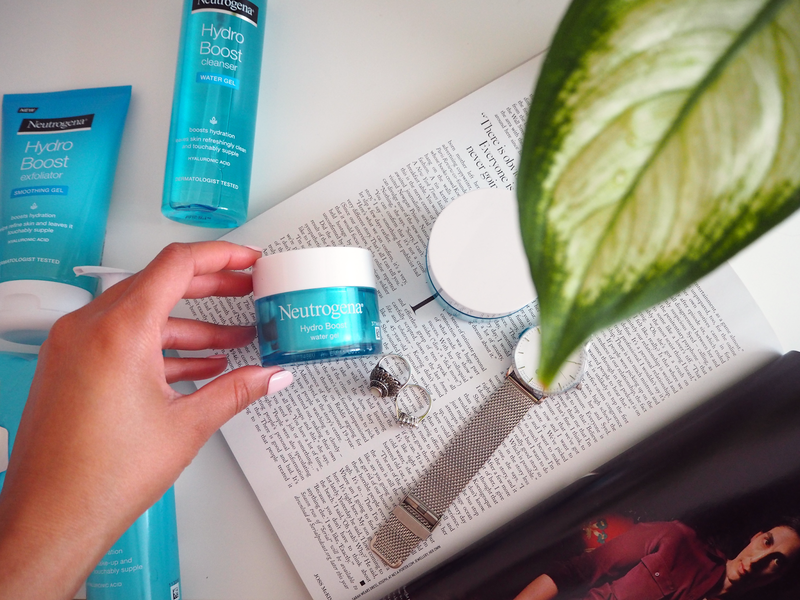 I start my day off doing a superficial cleanse using Neutrogena’s hydrating Water gel Cleanser which lifts away any dirt, excess oil and makeup. This cleansing gel uses a combination of Neutrogena’s cleansing technology, hydrating agent and Hyaluronic Acid which leaves skin supple and provides a boost in hydration. On my first use my skin felt super soft after just one wash. Tip; Wash and lather the product into clean hands, apply cleanser to the face using linked fingers from the jaw to forehead using upward circular movements, repeat the same step using downward circular movements and then remove. Next I go on to use my favourite product of them all, The Hydro Boost Water Gel. I've honestly never seen or felt a product like it. Have you ever used cool Aloe Vera gel on your face before? Think of this gel like that except it's non-setting and does not evaporate! The gel is refreshingly lightweight and keeps skin hydrated for a long-time - it's literally like you're feeding your skin all the hydration it needs. I've been drinking so much water lately, but have found no matter how much I drink there are still bits of my skin that are patchy and de-hydrated. Ever feel the same? With this formula, you are able to target problematic areas directly and see a difference in the skin almost instantly! 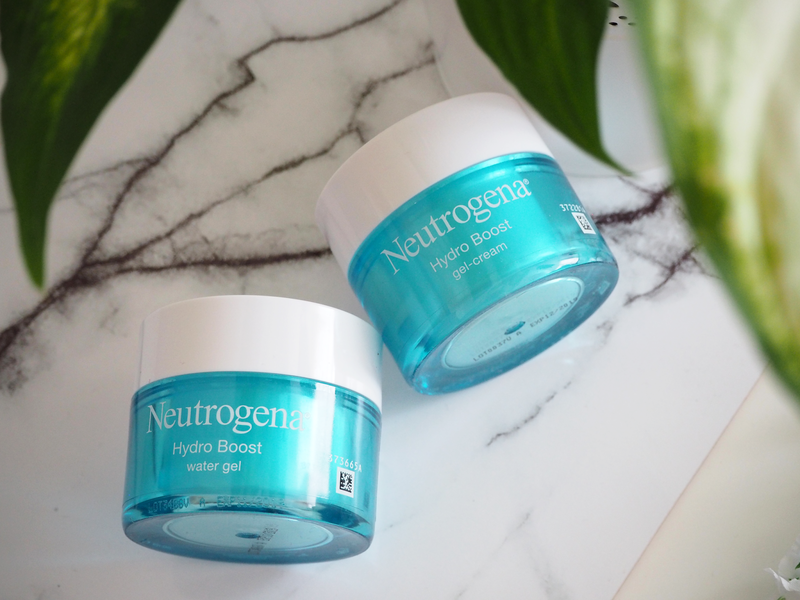 If you suffer with dry flaky skin which affect the way your makeup sits, you may want to start using both the Hydro Boost Water Gel and Cream before applying your full face. It'll have your skin looking super juicy - believe me when I say that! The Hydro Boost Gel Cream works in a similar way to the gel, helping to replenish the epidermis and protect the skin's barrier. If like me you work from home or are stuck in an office all day, these two products are great for just giving your skin that extra bit of hydration and TLC it deserves. Now when I'm back home after a long day out, I like to make sure I have taken off my makeup thoroughly using the Hydro Boost Range. I'll wipe my makeup off using Neutrogena's Hydro Boost Cleansing Facial Wipes (these wipes remove waterproof makeup), then exfoliate using the Hydro Boost Smoothing Exfoliator Gel and lastly use the Hydro Boost Gelée Milk Cleanser to wipe away any excess makeup. With this combination of products the skin is left clean, fresh, soft and oil-free meaning I can sleep well without having to worry about the odd pimple popping up as I've prepped my skin properly for a good night's rest. *Disclaimer* This post is in collaboration with with Neutrogena and contains links where I may earn a small commission. All my collaborations truly reflect my interests and contain honest opinions only!